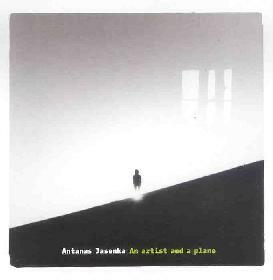 Antanas Jasenka - "An Artist And A Plane"
An Artist And A Plane is the follow up to Lithuanian composer Antanas Jasenka's 2002 album, Deus Ex Machina (see AI #21). Jasenka has been active since that time, teaching composition at the M. K. Ciurlionis Art School and performing at several festivals. The new album consists of a 5 part 40 minute suite titled "Artac" and a 20 minute piece called "Electronic Sutartines". "Artac" opens with a repetitive radio wave pattern that sets an almost rhythmic pace for the howling, pulsating and droning soundscapes that fill the space around it. Efx'd voices, clattering objects, orchestrations and much much more mingle and morph with the electronics to create a steadily developing, often intense, landscape that is sufficiently busy and emotionally charged to keep the listener engaged and with plenty to digest. Jasenka does an excellent job of leading the listener through a non-stop parade of sound that could have easily felt like one interruption after another. But the skillful layering and carefully choreographed introduction of each element makes for a seamless flow, each piece joining its partners at precision moments. Some of my favorite parts bring together the space music and avant-garde sound-art worlds, though Jasenka also makes interesting use of noise and aggression. "Electronic Sutartines" begins with spacey atmospherics, volcanic rumbling and bleeping UFO effects. (The CD notes define "sutartines" as the ancient Lithuanian art of polyphonic singing.) We're deep in the cosmos on this one, though still firmly in avant-garde realms. But a huge melting pot of sound ultimately takes over while a wave of ambient calm drifts along in the background. Strange backwards voices, howling winds, machinery, bells and a dizzying stream of bits and pieces are thrown at the listener, and right around the 14 minute mark the music reaches mercury bursting peaks of volume and pure sonic hostility. Very intense indeed. Jasenka has produced a detailed and challenging hour of sound exploration that can only be fully mined after multiple listens. Email Antanas Jasenka at: utoo@one.lt.